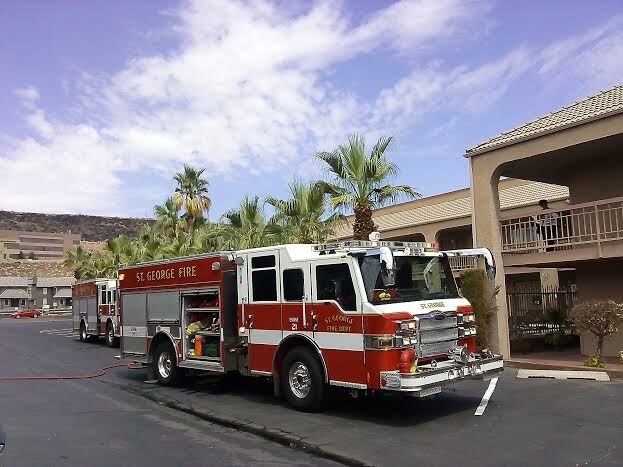 ST. GEORGE — A man was arrested Saturday afternoon after a fire in a room at the Claridge Inn was found to be suspicious. Just before 11 a.m., some guests staying at Claridge Inn, located at 1187 S. Bluff St., reported they could smell smoke near their room. St. George Fire arrived at the motel and located the fire’s epicenter on the upper floor in room 224. Firefighters snaked a fire hose up through the railing of the balcony and extinguished a smoldering fire that was billowing smoke but had no visible flames. The case was then turned over to St. George Police because the cause of the fire appeared to be a criminal act. St. George police officers arrived on scene and found the room trashed. The beds were tipped onto their sides and pushed up against the wall. Sheets, blankets, pillows, towels, books and other room items were found shoved into the bathroom, where the fire was contained, St. George Police Sgt. Rich Triplett said. The room’s smoke detectors were found disabled. The previous night, Claridge Inn management had received several noise complaints from guests but the police were never called. The room was registered to a man identified as John Goss, 41, believed to be a transient from out of state. St. George police officers were able to locate Goss walking on the sidewalk near Target on River Road. Goss was transported back to the motel for questioning, where police found sufficient evidence of the criminal activity. Goss was arrested and booked into Washington County’s Purgatory Correctional Facility on one first-degree felony arson charge. His bail stands at $20,000. There were no evacuations of the building and no injuries were reported.